In this article we meet interdisciplinary and action artist, Melina Pena, from Mexico. I think I found out through an open call page on Facebook. I decided to participate because the theme of superstitions caught my attention. The fear factor intrigued me. My work has lately focused on fear as a means of participation, where risk plays a major role. I thought Whistle Project added another layer to my research and creative process. It´s been a long process that started this summer in Sarajevo with a Live Performance in a gallery and then shooting in an abandoned hotel for a day thinking in the subject of Shamanism, Fear, Mexican Superstitions and personal experiences that I went through in my stay in Sarajevo. Performance, Action, Video, Sound. I didn´t base this work on any influences, it´s been a culmination of experiences and interests that I´ve been working on and off through the years. I believe in Shamanism and energies that are stuck and left in our surroundings, that can be moved by our own energy. I want to provide an alternate/fictional world as a means of survival and cleanse. I think story telling is what keeps us alive, in the sense of taking us out from the numbness of massive information we receive everyday. Storytelling makes us fly in the imaginary and create other possible ways of doing. The collective gives multiple possibilities and views to this imaginary. As an individual you can take it or leave it, add, recycle, edit and re-invent. I think any art project that is open to different ways of doing without going through a curating process is quite admirable and challenging. Something that should be done more. I want to go to the exhibition!!!! I´m curious to see everyones work. So should everyone! A re-invention through the process of walking, where layers of social construct and habit are removed and transformed. The whistle of death, the end of a phase for a new beginning. What does the song in the video talk about/ means? Cante jondo is a vocal style in flamenco. The name means "deep song" in Spanish. It is generally considered that the common traditional classification of flamenco music is divided into three groups of which the deepest, most serious forms are known as cante jondo. I used the voice of lamentation of El Agujetas in two types of cante jondo: Solea (solitude) and Seguiriyas. Both strong in sentimental value and expression. In this the voice of El Agujetas is layered over and over creating a new language of laments. The beginning of the piece we hear him repeating ¨ The time has come ¨ and gradually turning into a blur of laments. I think I didn´t decide to become an artist, it just happened. I was passionate in Dance since I was 6 years old and pursued my dream. This creative process has taken me to other areas of art as Performance Art, Sound, Video, but my body is still my base and starting point to my work. All the works created for WHISTLE project by Melina, will be available to the public during the transmedia exhibition. Melina Pena is an Action/ Interdisciplinary Artist from Tijuana, Mexico, raised on both sides of the border Mexico-U.S.A. Currently based in Barcelona, Spain. Melina Peña has been in an extensive search of her own body language training in Butoh, Experimental Dance, Body Landscape and Performance Art. She holds a Masters Degree in Independent Studies Program (PEI) by the Museum of Contemporary Art, Barcelona (MACBA). Post-graduate Studies on Sensory Language and The Poetics of Play, directed by El Teatro de los Sentidos/University of Girona, Spain. She doubled majored in Linguistics and World Arts & Cultures at the University of California, Los Angeles. 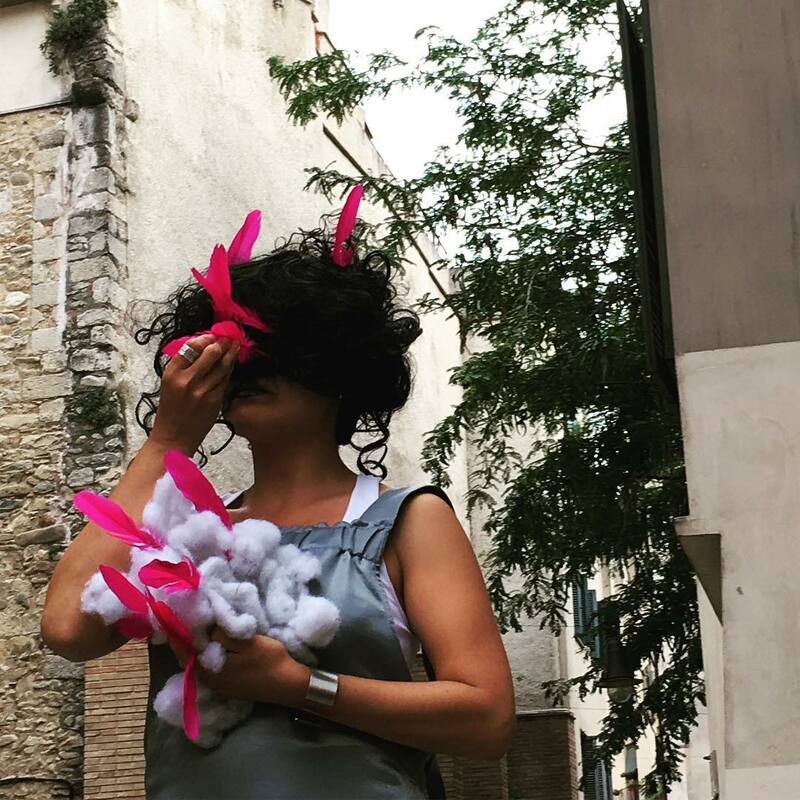 In the past 15 years Melina has been consistently producing and exhibiting art, showing her work in places such as the Cerveira Biennale, PAN Pallazo Naples, Venice Biennale, Galerie Taïss and La Cite Internationale des Arts in Paris. Artistic residencies and giving workshops in Germany, Mexico, Portugal, Estonia, Macedonia, England and Spain. Working with artists such as La Pochanostra, Shu Lea, Thierry Geoffrey and continuously collaborating with artists from different disciplines.